Home » News » Extron and Zoom Partner Up! 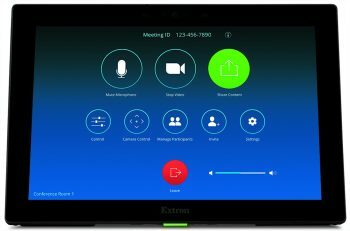 Extron has entered into a partnership with Zoom Video Communications, to extend Extrol control capabilities to any Zoom Room. The Zoom and Extron partnership enables organisations access to a a one-touch user experience for conferencing, collaboration, and AV room control, with no need for switching devices. Improving the user experience, and making your meeting spaces even more intuitive, users can now control their Video Conferencing and AV, alongside blinds, lighting and audio all from a familiar Zoom Rooms interface. – Casey Hall, Vice President of Worldwide Sales and Marketing for Extron. For more information about Zoom Room Hardware and Zoom integration, get in touch with our Zoom team today, or take a look at our Zoom pages to find out more.